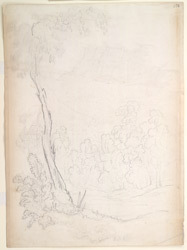 Unfinished pencil drawing by Philip Meadows Taylor (1808-1876) of an unidentified landscape dated c.1837. The image is inscribed on the front in pencil: 'Kooming (?) from Kupura. Dec. 10th'. This drawing was possibly made whilst Taylor and his wife were on their way to Bombay, on the first leg of the journey to England, when he had been granted three years furlough in order to regain his health; he had suffered from a recurring fever for some time. Taylor spent a large part of his career in India in the service of the Nizam of Hyderabad, in the role of soldier, adminstrator, Superintendant of Bazaars and Assistant Superintendant of Police for the southwestern districts of Hyderabad.